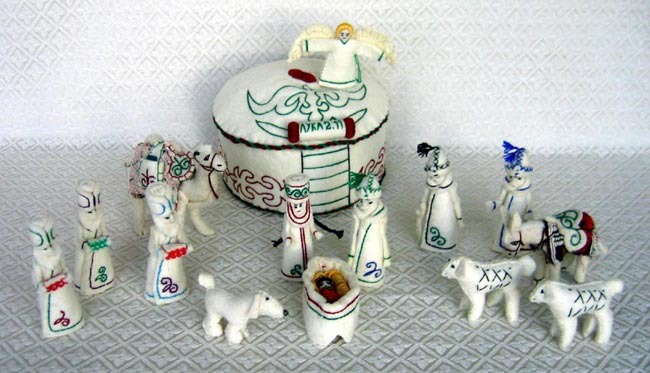 This Nativity is handcrafted from wool felt by Gulya in Kyrgyzstan. Mary, Joseph and baby Jesus are joined by 3 wise men, 2 shepherds, 2 sheep, a camel, a donkey, a dog, plus an angel and a star. The traditional figures are joined by a decorated yurt—the traditional felt dwelling of Central Asian nomadic peoples. On the front of the yurt a scripture reference is stitched in the Russian Cyrillic alphabet. The reference is Luke 2:11, which states, “For unto you is born this day in the city of David a Saviour, which is Christ the Lord.” The Joseph figure measures 4.5 inches to the top of his kolpok hat. The yurt measures 6 inches in diameter. The name “Kyrgyzstan” is embroidered on the inside base of the yurt. Gulya is very hard of hearing and relies on lip-reading and sign language to communicate. But her situation does not stop her from enjoying meaningful relationships with others. Gulya enjoys creating items from felt that tell a story.